Put on your diet goggles, it's time to start sniffing out foods that elevate you bad cholesterol levels. Foods high in cholesterol to avoid. If there are foods that lower cholesterol such as soluble dietary fiber rich foods like: oatmeal, apples, and prunes; there are also cholesterol elevating foods. Elevation in your cholesterol level (fasting lipoprotein profile: total cholesterol; LDL (bad) cholesterol; HDL (good) cholesterol; and triglycerides) increases the risk of developing lifestyle diseases or even heart diseases like arteriosclerosis. People with should eat foods high in cholesterol or otherwise cause elevation in cholesterol such as eggs (egg yolk), fast food (cheeseburgers), and mac-and-cheese (that contains whole butter, milk, and cheese high in saturated fat and cholesterol) in moderation, i.e. go on a cholesterol diet. Let's hope that everyone is watching their cholesterol level. Here we will discuss foods that increase cholesterol. Not many people know what high cholesterol means. That's why before talking about what foods cause high cholesterol; let's talk about cholesterol in general. There are 2 kinds of cholesterol which are good cholesterol and bad cholesterol. Good cholesterol does what it is supposed to do aid in the transportation of nutrients through your blood stream. On the other hand Bad cholesterol can increase blood pressure as it gets stuck to the walls of your blood vessels if too much is present in your blood. Now you can see why there is good and bad cholesterol. The cholesterol that negatively affects your health is bad cholesterol. High cholesterol means that you have more cholesterol flowing through your bloodstream. In most cases, high cholesterol may hint having high bad cholesterol. In your daily life you have to hear high cholesterol more time than necessary to get the point. Having high cholesterol and not knowing what it means is the equivalent of having a doctor tell you, "Oh no. No. No. Not this…" There's something wrong with you but you don't know what it is. Either way you look at it, it might as well be voodoo. I don't know about you but that is to cuckoo for me. Blood contains fat. The level of good cholesterol and triglycerides in your blood is considered stable. On the other hand, this doesn't always work out in the case of bad cholesterol. Due to the fact that bad cholesterol in your bloodstream clings to the inner walls of your blood vessels, it is considered the leading cause for high blood pressure. The following is how you can diagnose high cholesterol. There are many reasons why cholesterol increases. High consumption of cholesterol foods is one thing; and another are nutrients that increase cholesterol. Here are two types of fats that should be avoided when trying to keep your cholesterol level down to a respectable amount. Saturated fats are fats that lack unsaturated bonds. Meats, dairy products and tropical oils such as palm oil are considered to be high saturated fat foods. Although it is an essential nutrient that the body needs as energy, eating too much high fat foods with saturated fat can influence the increase in bad cholesterol as well as the risk of developing coronary artery disease. Trans fats are the byproduct of the hydrogenation of double bonded unsaturated fatty acid. Foods such as margarine, dairy free cream, some breads and snacks, and shortening are said to contain traces of trans fat. Trans fat is the fat that does the most damage to your cholesterol levels. Not only does it increase the amount of your bad cholesterol, making matters worse it lowers good cholesterol you need to reduce cholesterol levels down to a healthy amount. Eating trans fats comes with higher risk of developing arteriosclerosis. Here is a simple table to help- you determine if you are getting too much saturated fat, trans fat, and cholesterol in your diet in terms of your daily caloric intake. Eating foods that raise cholesterol too often only set you up to have your bad cholesterol rise increasing the risk of illness later on. Here are some high cholesterol foods that you had better stay away from or at the bare minimum moderate. Meats have both saturated and trans fats. For people with high cholesterol eating like a predator will only make you the prey of diseases caused by high cholesterol. In other words, if you have ever been told that you have high cholesterol, then maybe eating meat isn't for you. Chicken eggs contain 210mg of cholesterol per 50g. Chicken liver is no better with 148mg in 40 grams. Milk, cheese, and other dairy products are packed with cholesterol and trans fats. 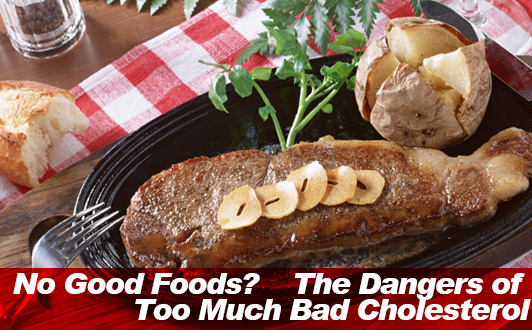 People with high cholesterol should eat high cholesterol foods in moderation. There is said to be as much as 3.4 grams of trans fat in 100g of coffee cream. 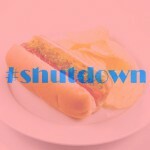 When it comes to fats, butter, margarine, and shortening take the boat in overall use in the household. In only 13 grams of butter (1tbsp) there is said to be as much as 27mg of cholesterol. Margarine and shortening are not better with 13 and 31 grams, respectfully. 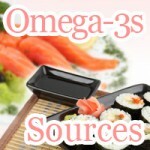 The main area of concern when eating fats is not just cholesterol and trans fats. On top of that fats are high in calories which make them the enemy to your diet when trying to cut back on calories. Just when you were thinking that your cholesterol levels were safe eating those snacks you just love, you were wrong. Cake and pastries are (despite how innocent they look) high in cholesterol and trans fats. Chocolate is low in trans fat (roughly 0.71g / 100g) but are high in saturated fat which makes them too much calories for what they are worth. Bread and grains such as barley that contains soluble dietary fiber said to lower cholesterol may seem like something you shouldn't have to worry about. However, noodles and some bread like croissants are high in trans fat. There is more to cholesterol than having high cholesterol. For one thing, having low good cholesterol is a problem. Another and possible the worst, having high bad cholesterol is what gets you. For adults cholesterol is an ever emerging problem. Eating healthy along is not going to help you lower your cholesterol. For best result working regular exercise into your routine is highly recommended. In particular, you are going to want to take up as much aerobic exercise as you can possible muster without burning out. I know… that sound like a lot of work. Let's just put it this way, is cholesterol something you want to put off till the last minute? - No, not at all. Like any potential health risk emerging from your diet or other lifestyle choices you make, getting proactive will take you for in life. I'm not kidding! 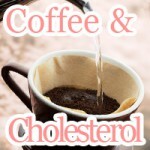 In this article we focused on what raises your cholesterol. Previously, we covered the just the opposite, foods to lower cholesterol. For further reference to start blasting away at stubborn bad cholesterol, you know where to go for more on the lowering cholesterol diet.